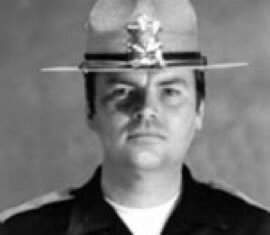 Trooper Harris was killed in a motorcycle crash. The 33-year-old victim was conducting speed enforcement in Parley’s Canyon. At approximately 6:30 p.m., Trooper Harris observed a vehicle speeding in the westbound lanes of Interstate 80. While pursuing the vehicle, Trooper Harris failed to negotiate a curve and lost control of his bike. He died instantly of massive chest injuries. The vehicle Trooper Harris was attempting to stop has never been located. Trooper Harris was married, the father of four children, and is buried in Parowan City Cemetery. His bronze name plaque is sponsored by the Utah Highway Patrol Association. I knew Danny. Grew up with him in 4th ward in Mesa, Arizona. He was a fun guy to be around. Always laughing and cutting up. I think of him when I see a Utah Highway Patrol man on a motorcycle – still to this day. He is missed! He was my Dad. I sure do miss him. I hope to see him again someday. Thanks for all those who have remembered him over the years. It has really helped me to never forget his sacrifice.